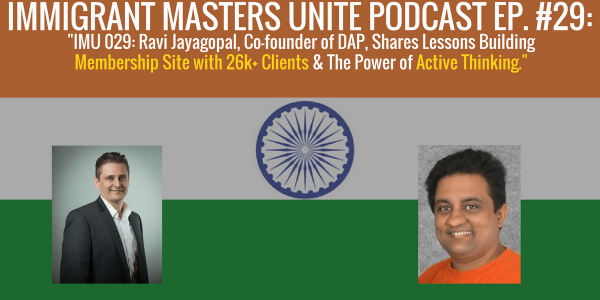 IMU 029: Ravi Jayagopal, Co-founder of DAP, Shares Lessons Building Membership Site with 26k+ Clients & The Power of Active Thinking. | Immigrant Masters Unite Podcast: Transform Your Business, Life and The World Around You! Why is it that some people become successful in life despite constantly having to overcome crazy obstacles? And how do they come up with those creative solutions to overcome those obstacles? More importantly, how do they take powerful actions despite being knocked down in life? Today, I want you to meet Ravi Jayagopal, a successful immigrant who came from India. Ravi is co-founder of a very successful membership plugin that works with wordpress called Digital Access Pass that has passed over 26,000 paid clients and is one of the most popular membership platforms online. But he wasn’t always successful. How Ravi overcame many obstacles not only in his business but his personal life, including green card issues and running an online business with high fixed costs with no ability to collect payments online. The importance of having regular “active thinking sessions.” You’ll learn what these sessions really look like and how they will help you with your creative thinking, creating powerful relationships and building successful businesses. Why sacrificing for the short term to gain freedom in the long term is so important to success and how Ravi used it to build his company while working full time at a regular job. Why having an online membership site can be a great revenue model for your business. If you’re passionate about something, membership model can be a great solution. Just make sure you have these 3 top INGREDIENTS in place before you start your next membership model business. One piece of advise Ravi offers to immigrants who come into the country and how following this mantra has shaped his success in life.